Following its smash hit run at London’s Dominion Theatre, Tim Rice and Andrew Lloyd Webber’s Evita will return to Glasgow in May 2018. 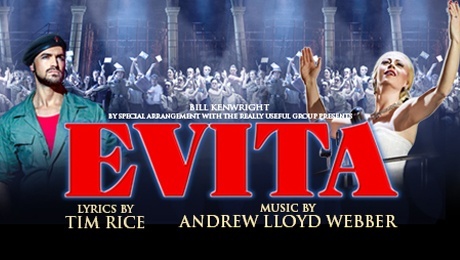 Bill Kenwright’s production of Tim Rice and Andrew Lloyd Webber’s Evita is set to thrill audiences once again across the UK. Starring two of musical theatre’s most outstanding leading performers; Madalena Alberto returns to the role of Eva, a role she received critical acclaim for in the 2014 West End revival. Other theatre credits include the role of Piaf at the Curve Theatre and Fantine in the 25th Anniversary production of Les Misérables. Joining her in the role of Che, fresh from the recent West End production, is Gian Marco Schiaretti, who also played the title role in Disney’s production of Tarzan. Don’t miss your chance to see Evita the Musical live in Glasgow!